The M82A1 is a Semi-Automatic, air cooled, box magazine fed Rifle chambered for the .50 caliber, M2 Browning Machine Gun cartridge (.50 BMG or 12.7 x 99mm NATO). This rifle operates by means of the short recoil principle. 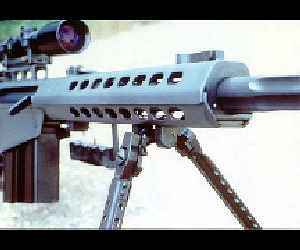 The weapon system is comprised of the rifle (M82A1A) with a Unertl 10-power scope and an additional box magazine. The system comes packed in its own watertight, airtight carrying case with an air release valve for aircraft transportation and the requisite cleaning rod and brushes. The basic M82A1A rifle is equipped with self-leveling bipod, muzzle brake, carrying handle, metallic sights, and 10-round box magazine. The weapon is 57 long and weighs in at a whopping 32.5 lbs. It fires from a 10-round detachable magazine. Maximum effective range is just over 1800 meters. There is also a back pack for cross country transport and a bandolier for extra magazines is available. The M82A1A is designed to provide commanders the tactical option of employing snipers with an anti-materiel weapon to augment the present anti-personnel M40A1 7.62mm weapon. The rifle is manufactured by Barrett Firearms Manufacturing, Incorporated of Murfreesboro, Tennessee. The scope is manufactured by Unertl to match the trajectory of .50 caliber Raufoss Grade A (DODIC A606), which is the standard operational round.